HOW MUCH DO YOU REALLY KNOW ABOUT MICKEY MOUSE? In his 85 years of animated existence, ever-youthful Mickey Mouse has lived a memorable life. Now Disney historian Jim Korkis chronicles that life in mesmerizing detail. 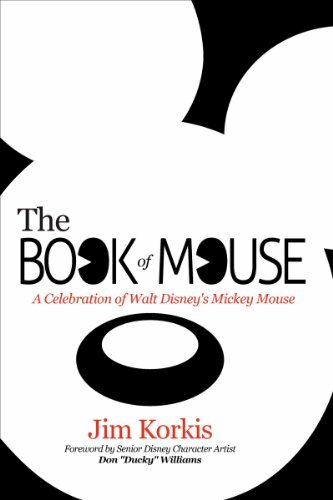 From Mickey's humble beginnings on Walt's Disney sketch pad through his dozens of films to his embodiment of the Disney dream and his popular appearances in the Disney theme parks - it's all here, in The Book of Mouse. Until now, Mickey Mouse's life story was scattered across decades of books, articles, oral histories, and crumbling documents found only in the Walt Disney Archives. In The Book of Mouse, Jim Korkis brings together all of these essential elements for the first time into a narrative that celebrates this very special Mouse. Starting with the real story of Mickey's creation, Korkis weaves well-researched facts with charming, insider stories and anecdotes. You'll learn about the hidden secrets of Steamboat Willie, Mickey's first film; the astonishing success of the first Mickey Mouse Club; the Mickey cartoons never made; the history of the Mickey costumed character in the theme parks (and the people inside them); the special relationships Mickey had with presidents, movie stars, playwrights, magicians, and even astronauts; and plenty more jam-packed in over 300 pages. In addition, the book features a complete list of Mickey's film and television appearances, with plot summaries, production notes, and trivia. Mickey Mouse is a film star. He's a television star. He's the star of best-selling books, cartoon strips, and comic books. His image sells millions upon millions of dollars in merchandise. He's the leader of the band, the central figure in the Disney universe, and perhaps the most recognizable character in the world. Everyone knows Mickey. But there's so much you don't know about Mickey. Plus answers to: How tall is Mickey? Where does he live? Why does he only have four fingers? Is he married to Minnie? And so much more! The Book of Mouse is a biography, ethnography, and filmography in one, the world's first comprehensive, single-volume resource about Mickey Mouse. With its hundreds of fun stories, Mouse-ka-Tales, and Mickey milestones, the book is sure to enlighten and delight Mickey fans of all ages. Become the Mickey Mouse expert in your family!